Another solid week of reading. Here are my goodreads reviews. If you’re on goodreads, add me as a friend so I can see your books too! The 4 Habit of Joy-Filled Marriages (3.5stars): I’m a firm believer that it’s easier to work on your marriage when it’s working than when it’s in trouble. It’s easier to do things to strengthen a solid base than to patch up one that’s teetering. I make a point to read these kinds of books when I am feeling like we are in a good place and feeling a lot of love towards my spouse. This way it doesn’t feel like the exercises explained in this book are coming from a place of despair but a place of love and connection. When I saw the title of this book, it sounded like the exact thing that might be a wonderful addition to my life. I definitely have 15 minutes a day and I love the idea of a joy-filled marriage. This is a really quick read. I finished it in one sitting. But, of course, most of the value of this book is not in the reading of it but in doing the exercises suggested in the book. Much of the science in the book wasn’t new to me and was explained in a way that felt too simplistic (though I can totally understand why the authors would choose that path, this is not a science book.) But I really liked a lot of the suggestions in the book and the perspective they added. Joy isn’t simply a choice you make. Trying to choose joy can feel like trying to fall asleep when you have insomnia. Joy is a feeling you get when you’re happy to be with someone who’s happy to be with you. I don’t know that I agree with all of that (I think it’s possible to experience joy when you’re alone, too.) but the idea that joy isn’t the choice but the outcome resonated with me and I’ve been noodling on it since. I really liked this idea. While it’s terribly hard to do this in the moment of a major disagreement, this idea is a great one to keep reinforcing and baking into the fabric of our marriage. I also really liked their clear definitions around the negative emotions you feel so that you can recognize your own emotions. Naming the difference between sad, anxious, despair, shame, anger and disgust can be subtle and difficult at times and it’s not possible to address your (or others’) feelings unless you can connect with them and tell the difference. I have learned that there is a big difference between saying “thank you” and feeling appreciation. This, too, was a poignant sentence for me. Often times, even in a gratitude practice i do alone, it can be easy to list things from the day which isn’t always impactful. Whereas, if i sit down and close my eyes and really conjure the feeling of that moment I am listing, I can feel the contentment and joy. Appreciation is about feeling the joy, and sharing the joy. Many of the exercises in this book are about being together, holding hands, sharing stories about your day, your past, your marriage. The exercises are simple on paper. They encourage connection both physically and emotionally (and psychologically.) and I can totally see how it completely strengthens (and adds joy) to your marriage when you do them regularly. I will mention that this book has Christian-based religious references which wasn’t clear from the blurbs. It’s not the core of the book but there are many examples. Had I looked up previous books of the authors, I probably would have been able to guess that. I focused on the examples that resonated with me and the concepts they were highlighting. Overall, this book is a great way to strengthen your already strong marriage. It’s also a wonderful way to start a new marriage. The Editor (3.5 stars): I read and really loved Rowley’s previous book, Lily and the Octopus, so I was looking forward to reading this. I know some people are big fans of Jackie Onassis but I knew very little about her and wasn’t sure this book would be interesting enough. In fact, I had no idea she’s been an editor for many years, so I wasn’t sure if the author had made up that premise. Apparently, he did not. While some of the color added by the Jackie bits were fun, to me, what made the book enjoyable was the story under the story (always) and in this case it’s about the relationship between the main character and his mom. It’s about family, connection, belonging. So much of this resonated with me. Both the feeling of lack of belonging and lack of identity and the feeling of being so much myself. I feel like both of those things can be true at the same time. This book is quiet. It’s slow. There are a few big things that happen but it’s really not even about those things in the end. This is not a “let me read and see what happens” book. It’s a book where if you connect with the characters, you like it and if not, you might not. thanks to netgalley and the publisher for a preview copy in exchange for an honest review. 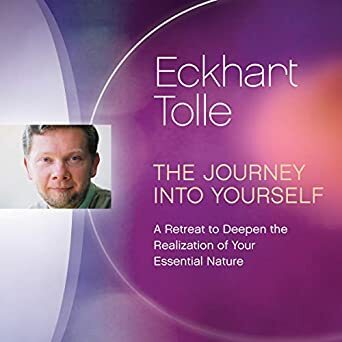 The Journey into Yourself (3.5 stars): It seems a bit weird to be giving Eckhart Tolle anything but five stars. I like to make sure to listen to these at least a few times a year. I think the reason it’s not a five-star for me is because I’ve heard these types of thoughts/teachings several times and there wasn’t much new here for me. That doesn’t mean it wasn’t life changing the first time around and it also doesn’t mean I don’t get value out of it every single time. I read that someone said his calming voice is soothing and wonderful for them but for me, it has a bit of the opposite effect. I tend to prefer Tara Brach or Sharon Salzberg because I connect with their voices right away. Also Karen Maezen Miller. But this might be the one better suited for you. I think when you’re doing this type of work, it matters most to connect with the person so you can be more open to hearing the teachings. I am grateful I took the time to listen to this. I am grateful for the learnings. I am grateful for the reminder that my stories are just that, my stories. Beneath the Sugar Sky (4.5 stars): Another gem from Seanan McGuire. I can’t believe no one recommended these books to me in the last few years. They are absolutely amazing. The detail and creativity in each book is only overshadowed by the variety in her characters who are all so unique and so layered and delightful. And the dialogue is exceptional and observant. These tiny books pack so much. I have only one more to go which is due at the library in a week and I am almost sad to start it because then I will not get to fall into one of McGuire’s worlds until the next one is out. This story, like the second one, does not require you to have read the first in the series. More than a series I’d say these are companion books. They can be completely stand alone but if you’ve read the first one, there are a few repeat characters, making the experience deeper and more delightful. It’s such a joy to find books like these. This was a very interesting read. It reads like a memoir when it’s fiction. Even after reading it, I am not sure if parts of it are true vs made up. I guess it doesn’t matter. It reads like a raw memoir of a woman recently diagnosed by MS. I have an ex-boyfriend who has MS so I was curious to see what the author wrote about it. While there are some bits about MS itself, the book, was so much more. It was about helplessness, anger, frustration and all the feelings you feel when your life starts on a negative spiral and doesn’t seem to let up. There are so many simultaneous horrible things in this character’s life. I don’t want to ruin any of the plot but it’s just one bad news after another. And then she tries to fight it all and that ends up backfiring on her. I’m glad it was a short novel, I am not sure I could have taken it if it were twice as long. But I am also glad I read it. Our Life in a Day (4 stars): I don’t know why I thought this was going to be a cute story with cute little bits. It wasn’t. Maybe the “game” concept threw me off from the beginning and I had expectations that it would be light and sweet. So I think it’s important to make it clear that this is not a light book. In fact, I’d say the opposite, there are several heavy subject matter in these pages. I want to give trigger warnings but I can’t really do it without giving away some of the plot so I will refrain. Just make sure you’re going in with the expectation that there is serious, heavy, difficult topics discussed in this story. Now that that’s out of the way, this book wasn’t a quick/easy read for me despite the fact that it’s a small book. Maybe it was partly the subject matter, and the jumping back and forth in time due to the nature of the “game”, but I think it also was that I didn’t feel invested in the characters and their relationship. Ordinarily, I love character novels. I don’t need a plot to make me happy, but I do need rich, layered characters and we had some of that here. The characters were real and flawed but since most of the stories are from Tom’s perspective, we get a lot more of the depth of his feelings than Esme’s. And even though we do learn a bunch about her (and she’s definitely not 2-dimensional) she’s not as rich as I would have liked. ‘Me too,’ she said, shifting slightly closer to him, ‘But you’ve got to remember that it’s not just about today. It’s the whole year we’re celebrating. It’s always dangerous to plan these things too carefully. I loved this part. I’ve been guilty of focusing too hard on an anniversary, a new year’s eve, a moment in time and then having so much ride on that moment. It’s so important to have all that in context. He knew as he was doing it that he was making up a different version of his life. The one he wanted people to see when they looked at him and Esme. Not the actual one they were living. Complete with all its unhappiness, secrecy, and heartbreak. This made my heart break. Don’t we all know how this feels sometimes? The way things look. The way we try to make things look. It’s important to remember this when looking at others too. How they are also trying to do this. Most of this book felt raw, real, true. It didn’t shy away from the hard things. It didn’t sugarcoat how hard it is to live with mental health issues, how hard it is to be in a relationship, how flawed we humans are. It’s rare to see a book like this. I almost wish the “gimmick” wasn’t there because, for me, it took away from the depth of this story a bit. thank you to netgalley and the publisher for a free copy in return for an honest review. This particular book is Lundy’s story. As a book reader, it was one of my favorites. I loved her, I loved the deep dive into fair value. There is so much ache in this story. There’s so much depth. That’s what’s so unique about these books: there’s so much depth in both the imagination and the ideation. The philosophy behind each place and the richness of description, the depth of character building. Each of these are exquisite and well-crafted. I have loved every single one of these books and I cannot wait to read more. I hope the author keeps giving us more and more of these wonderful children and their worlds. I Owe You One (4.5 stars): Loved this book! I haven’t always been a Sophie Kinsella reader but I’ve read her on and off for the last five years or so and I like her quirky but real characters. It’s important for you to know what you’re signing up for when you read her books. These are fun, sweet books and if you go in with a different expectation, they will disappoint or frustrate you. I find that there are moments where her books are just right for me. I like the windy plots that you know are going to end well. I like that she drives you mad with “why is the character doing that? !” but deep down you know the character is just being human and it’s hard to be a human. Her characters grow as you read the book and you fall in love with them piece by piece and root for them even as they drive you mad. And then when the book is finished, you feel sad knowing you will not get more of those characters. I think this book was exactly what I needed right now. It’s light, it’s sweet, it’s like a nice, warm hug that made me smile.